Keen to explore new creative avenues, producer, DJ, film scorer and composer Kate Simko ventures into unchartered musical terrain. 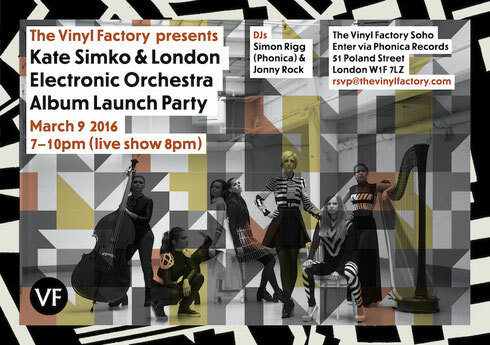 This spring sees Simko and her London Electronic Orchestra release their self-titled debut LP - a project that showcases a symbiotic blend of orchestral soundscapes and electronic music. Kate began experimenting with combining classical instruments and electronic music while getting a masters at the Royal College of Music. A classically trained pianist, the Chicago native has been remixing Philip Glass, collaborating with Jamie Jones, producing for Katy B, touring an audio-visual live set, and playing to audiences from London to Ibiza with her LEO shows and at clubs worldwide as a DJ. Kate composes the orchestral parts and produces the original LEO songs in their entirety. But she is the first to say that collaboration is a key component to the project. Fresh from engineering ASAP Rocky's new LP, Grammy-winner Bea Artola recorded the majority of the album in London. The record was mixed in New York by Dan Bora, who's worked with artists such as Laurie Anderson, Sufjan Stevens, Nico Mühly and Matmos, and is Philip Glass’ main sound engineer. The album is out 6 May on The Vinyl Factory.